The world is abuzz with talk about US Federal Reserve and whether it will raise interest rates in September. Interest rates have hovered near 0 percent since 2008, and a rate hike to .25% or .5% is possible. Analysts are asking basic questions: Is the economy strong enough? What do we make of economic problems in China? Is the housing market heating up? Do declining oil prices mean a global slowdown? Are employment rates sufficient? Have we seen the end to Greek crisis? How would an interest rate hike affect the volatile financial and stock markets? My book, just out on Amazon, doesn’t predict what the Fed will do, but provides background on the Fed and how it works. It also introduces a process that classes and organizations can use to make their own analysis of the situation. 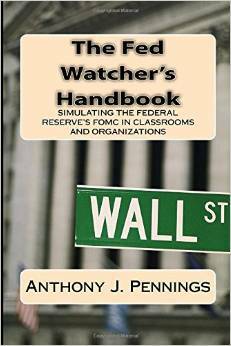 The Fed Watcher’s Handbook: Simulating the Federal Reserve in Classrooms and Organizations is available on Amazon either as a paperback or electronic Kindle version. 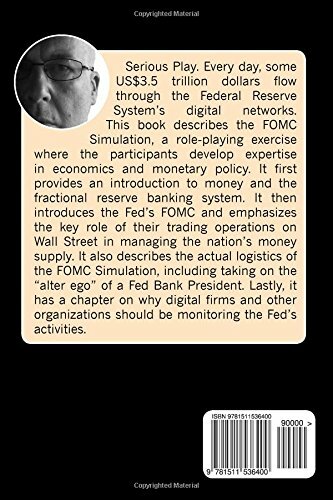 The book introduces the Federal Reserve System, the Federal Open Market Committee (FOMC), and a simulation I developed at New York University to make economics and monetary policy more relevant and easier to understand. I later used it at the MBA level, and I’m currently exploring its use as a team-building exercise for organizations. In the simulation, participants become a member of the US central bank, either a district president or someone on the Board of Governors. The “Fed” is made up of 12 districts such as Chicago, Boston, Atlanta, New York, Dallas, etc. Participants have to study the bios of the Presidents or Governors and then report on their district. Then we meet a day or two before the actual Federal Reserve meets and simulate their discussions and voting process to determine interest rates. We even collectively write the press release after the group decides. These activities allow them to compare the process and results of the simulation with what occurred at the actual Fed FOMC meeting.